There are many ways to get involved and help support our conservation work in New Brunswick. 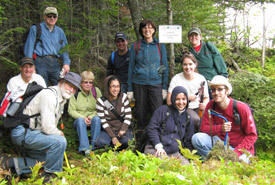 Volunteers play an important part in furthering the mandate of the Nature Conservancy of Canada (NCC) in New Brunswick. They bring a different perspective, a variety of expertise and unmatched enthusiasm to protect the region’s ecological integrity. They actively participate in the management of natural areas, monitor species on our properties, report issues such as illegal wood harvesting or vandalism and keep a watchful eye on our nature preserves. The Nature Conservancy of Canada's Conservation Volunteers (CV) program engages people in the protection of Canada's habitats and species. It also provides a meaningful, hands-on educational experience in important natural areas. Our events are carefully designed to ensure your volunteer time is dedicated to critical conservation action. The Conservation Volunteers program offers volunteers opportunities to join staff on projects that contribute to the long-term stewardship of ecologically significant properties owned and managed by NCC and our partners, right across Canada. To speak to the Conservation Volunteers coordinator in NCC's Atlantic Region, please contact Laurel Bernard at 506.450.6010, ext. 211. Volunteers may be recruited to form local stewardship committees. These committees are vital in the maintenance of our nature preserves. They provide valuable input on future management decisions. Volunteers help monitor plant and animal species in our nature preserves. Amateur and professional botanists and birders contribute important information on the status of rare and endangered species. Volunteers may also participate in the physical maintenance of the property, help erect signs to outline the property’s boundary lines or clear walking trails.